bedeutender russischer Chemiker und Mediziner. Bis heute berühmt ist er als Klavierdilettant und Komponist (1833-1887). Eigenh. Brief mit Unterschrift. no place. 8vo. 1 page. 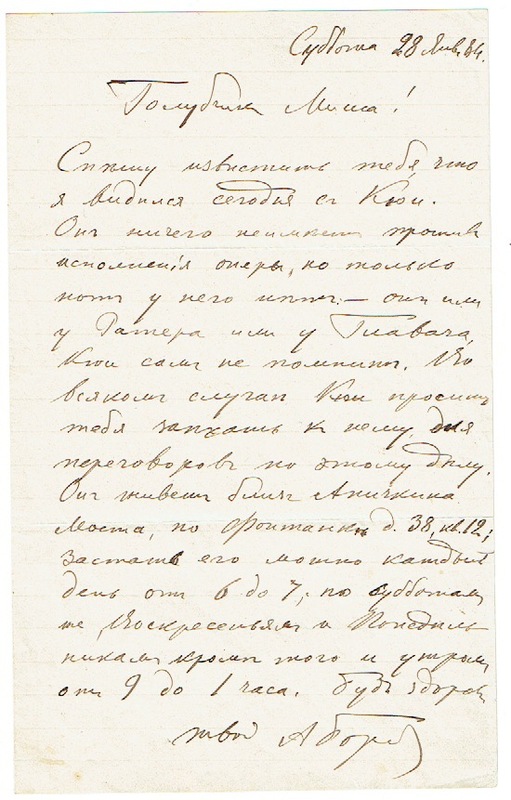 Letter addressed to the Russian conductor and composer Mikhail Romanovich Schiglev (1834-1903). 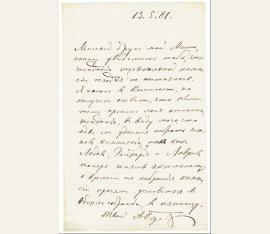 Schiglev was one of the closest friends of Alexander Borodin. „I hasten to inform you that I have seen Cui today. He’s got nothing against performing the opera*, however he’s got no music score: either Rahter or Hlaváč has it, Cui doesn’t remember. In any case, Cui would like you to come by and have negotiation about it. He lives near the Anichkov bridge along the Fontanka river, house Nr.38, flat Nr.12. You can find him there every day from 6-7 pm, and on the saturdays, sundays and mondays also in the morning from 9 to 13 pm. Take care. Aleksander Borodin“ - *Apparently it’s about intention to perform one of the operas of Cesar Cui at "the St.Petersburg Circle of Music Lovers" (St.Petersburg amateur choral and orchestral society), where Shiglev was as the conductor. Cesar Cui (Цезарь Антонович Кюи) - famous Russian composer, Member of the famous group of five Russian composers "Moguchaya Kuchka" ("the Mighty Handful") https://en.m.wikipedia.org/wiki/César_Cui https://en.m.wikipedia.org/wiki/The_Five_(composers) Vojtěch Hlaváč (Войцех Иванович Главач), (1849-1911) - Czech-Russian composer, choirmaster, organist https://ru.m.wikipedia.org/wiki/Главач,_Войтех_Иванович Daniel Rahter (1828-1891) - famous german music publisher https://imslp.org/wiki/D._Rahter. 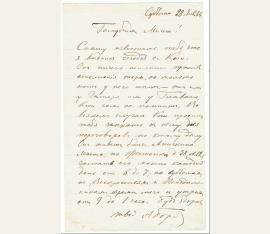 Letter addressed to the Russian conductor and composer Mikhail Romanovich Schiglev (1834-1903). Schiglev was one of the closest friends of Alexander Borodin. „I hasten to notify you that the meeting of music commission today did not take place. 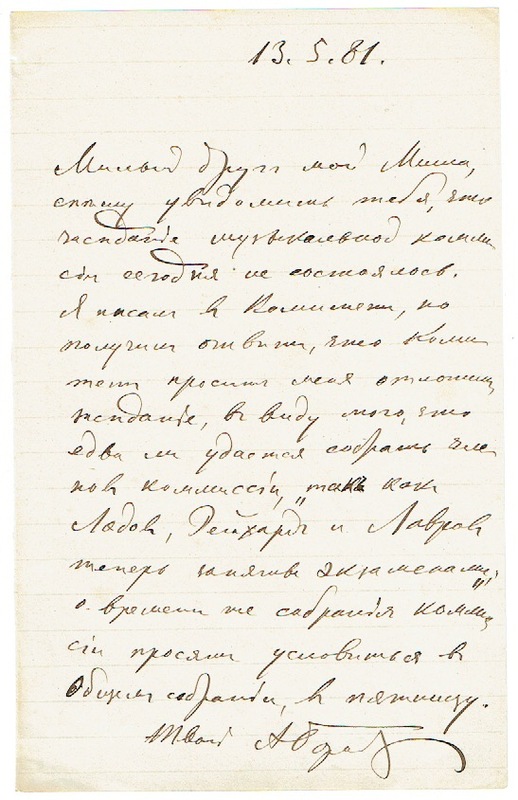 I wrote to the committee*, but got a reply that the committee ask me to postpone the meeting due to little chance of being able to get all the commission members to convene, "as Lyadov, Reichardt and Lavrov are busy with the exams." Regarding the time of commission’s meeting - it will be decided upon at the general board* on Friday. Your Aleksander Borodin.“ *Steering committee of "the St.Petersburg Circle of Music Lovers" (St.Petersburg amateur choral and orchestral society). *General board of "the St.Petersburg Circle of Music Lovers" (St.Petersburg amateur choral and orchestral society). Anatoly Konstantinovich Lyadov (Анатолий Константинович Лядов), (1855-1914) - famous Russian composer https://en.m.wikipedia.org/wiki/Anatoly_Lyadov Alexander Vasilyevich Reichardt - Russian pianist, professor of the St.Petersburg conservatory, student of Alexander Drayschöc (1818-1869). Nikolay Stepanovich Lavrov (Николай Степанович Лавров) (1861-1927) - Russian pianist, professor of the St.Petersburg conservatory, one of the closest friends of Anatoly Lyadov..